It may look like a UAV to you and me, but to an S-400 anti-aircraft battery, this tiny drone looks as big and as menacing as a B-29 Superfortress. 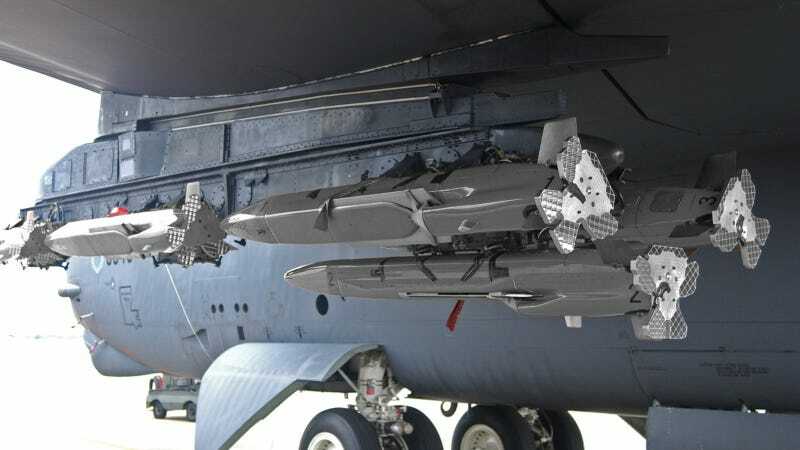 The Miniature Air Launched Decoy (MALD) is a nine-foot, 300 pound drone designated for electronic warfare and designed to copy the flight profiles of US aircraft, which confuses the enemy's integrated air defense systems. The MALD is launched from an aircraft in-flight and travels a pre-programmed course of up to 100 checkpoints over a 500 nm range. As it's flying around, its state-of-the-art Signature Augmentation Subsystem (SAS), comprised of various active radar enhancers covering a range of frequencies, is pumping out signals that mimic the radar signature and flight profiles of a larger, more dangerous, allied aircraft—anything from the B-52 Stratofortress to the F-117 Nighthawk. By launching a small armada of these drones into enemy airspace, they force anti-aircraft batteries to either remain inactive—potentially letting what looks like a fleet of bombers pass overhead—or open fire and reveal their positions, thus allowing the real bombers to strike. The MALD system has been under development since 1995. It started out as an even smaller, $30,000 drone built by Northrop Grumman that relied on a J-50 rocket engine. Unfortunately this design proved to have too short a range to be effective, so the US Air Force scrapped the program until the early 2000's. In 2003, the USAF reopened bidding on the program and Raytheon won out with the slightly $120,000 version in use today. That may seem a bit steep for an expendable decoy, but it's certainly a lot cheaper than having a $70 million fighter shot down. The original MALD design has been augmented in the past few years to also include jamming capabilities. This additional signal output further confuses SAM sites and accurately replicates the jamming signals (I believe raspberry flavored) from stealth aircraft. This means that, instead of sending a manned EA-18G Growler into hostile territory, the USAF can simply toss a couple of MALD-J's into the fight, and they'll loiter over the battlefield, confusing the hell out of enemy forces. "MALD-J will save the lives of aviators because commanders will be able to use MALD-J to conduct dangerous stand-in jamming missions instead of using manned aircraft to do the job," said Harry Schulte, vice president of Raytheon Missile Systems' Air Warfare Systems, said in a press statement.